Perfect for the younger beginner! SMALL IN SIZE. BIG ON QUALITY AND SOUND. 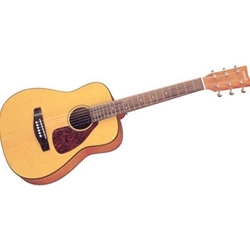 The steel string JR1 is modeled after the FG series. Yamaha craftsmanship and the use of select woods throughout this instrument create a compact folk guitar offering authentic acoustic sound.